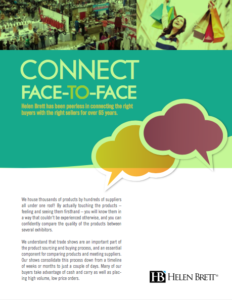 Find and connect with hundreds of suppliers showcasing thousands of products – all under one roof! Helen Brett prides itself on being a leader in the wholesale gift, jewelry and merchandise industry. For over 70 years, our jewelry and gift trade shows connect buyers with sellers. All Helen Brett shows are for the trade only. Discover how Helen Brett has connected the right buyers with the right sellers for 70 years. No one under 16 years of age is permitted entrance to Helen Brett shows, and will not be issued a Gold Card. Proof of age is required at show registration with a government issued photo ID. Infants must be carried in a front or back carrying pack. No wheeled carts of any kind, or strollers will be allowed on the show floor. Wheelchairs, walkers, and mobility scooters are permitted. Helen Brett Enterprises has the right to deny entrance.